Even when one is a longtime, jaded denizen of a major city, celebrity sightings can still induce a thrill. During my tenure in New York City, I ran across my share of famous names, though I’ve never been one to bother a stranger, world famous or no. This almost changed when I ran past Ira Glass one evening and found myself sorely tempted to chat him up. I’m sure he'd be glad I resisted the urge, but having heard his voice on the radio every week for well over a decade… well, I felt like I knew him. 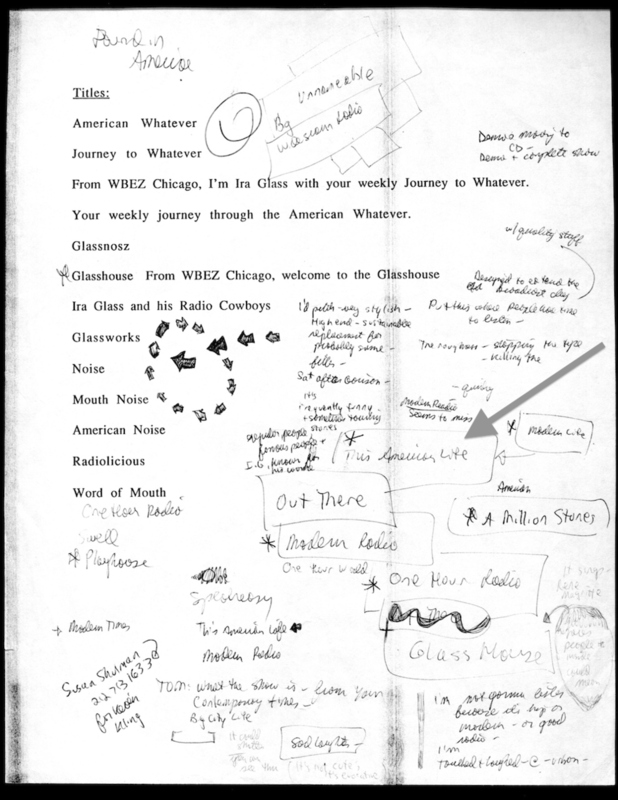 Since 1995, Glass has hosted This American Life, perhaps the most popular public radio show ever produced and---before its hugely successful spin-off Serial—the most popular podcast in the U.S. The show is quickly approaching its twenty-year anniversary (its first episode aired November 17th; hear it here), and in honor of that milestone, we revisit another: the show’s 500th episode, which aired in 2013. For that occasion, Buzzfeed visited with Glass for a revealing interview. Somewhere in the Arabian Sea — "I love how funny and human-sized everyone is in this show. It’s a surprisingly funny show about the war on terror," Glass writes. Switched at Birth — Glass: "The structure of this show — where the whole episode you wonder how a mom could know for decades she was raising the wrong baby and finally, she answers it in the end — is perfect." Break-Up — "The standout story is Starlee Kine’s essay on breakup songs, which includes an interview with Phil Collins that’s so menschy and real, it changed how I saw him forever." Babysitting — "Especially the interview with Myron Jones, which is the best interview I’ve ever done, mainly because he had so much grace and humor talking about his past. Any question I could think of, he’d come back with an amazing story, which is rare." My Big Break — "David Segal takes a turn in the middle of this story that’s one of my favorite reveals in any radio story ever." Harold Washington — "How can you go wrong when the central figure in your story is funny and cantankerous and bighearted and idealistic and utterly pragmatic and on top of all that, totally charismatic? If you don’t know who Harold is, be prepared for a treat." Heretics — "Carlton Pearson, like Harold, is someone they should make a movie about, for lots of the same reasons. An idealistic preacher whose idealism costs him pretty much everything: the church he runs, his reputation, his fortune, nearly his family." I kind of wish they’d gone with the latter, but it’s hard to imagine the show we know as This American Life could ever have been called anything else. (See it penciled in almost as an afterthought above.) The show's title perfectly sums up the breadth and scope of a program that tackles everything from the trivial to the highly consequential, often back-to-back in the same themed hour. Though Glass would surely balk at such high praise, I think his show has done more to help Americans know and understand ourselves over the last twenty years than nearly anything else on radio, TV, or the podcasting world.